A user can only report information that they have â€œreadâ€ access to. This means that if they cannot see a certain userâ€™s data, they cannot report it either. This applies for both field level security and object level security. Page layouts have no impact on reporting capabilities. Click reports tab, click on report. â€œRun Reportsâ€ permission required. Standard reports are the ones that come pre-installed. They cannot be modified or removed. Reports tab, Create New Custom Report. 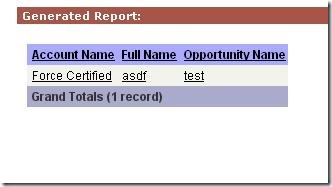 â€œCreate and Customize Reportsâ€ permission required. You can also run a report, make changes and then save it as a new report. On the reports tab- When you click â€œFind Reportsâ€ only custom reports are listed. 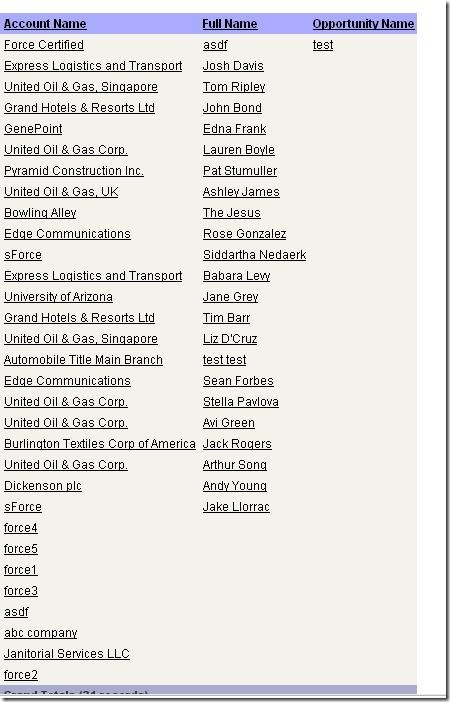 Tabular â€“ simple list (CSV style report). Provides totals for the entire list of data. Summary â€“ sorts and sub-sorts data by row. Provides totals for each section of sorted data (rows). Matrix â€“ sorts and sub-sorts data by row and column. Provides totals for each section of sorted data (rows & columns). Pro+ edition, permission â€œManage Custom Report Typesâ€ required. 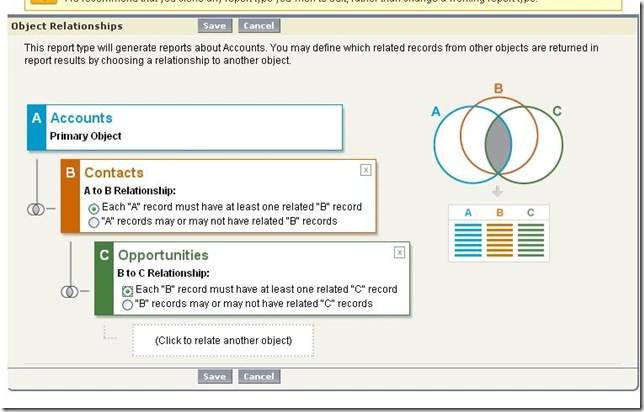 A report type links data from different objects together through lookup or M/D relationships. The link travels the reverse direction of the relationship for Report Types (the data in the related list, not the lookup relationship itself). 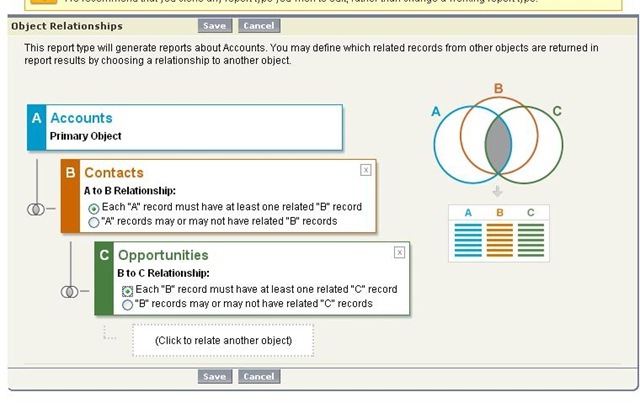 For instance, if Account is your primary object then you can link to Contacts and Opportunities. Whereas if Contacts were your primary object, you could link to activities but not accounts. Limit of 4 objects per report type. Example: Show all accounts, and any related contacts, and any related opportunities. You can add data from related lists as custom fields on your report. This is a fantastic alternative to creating simple cross object formulas to accomplish the same on standard reports. 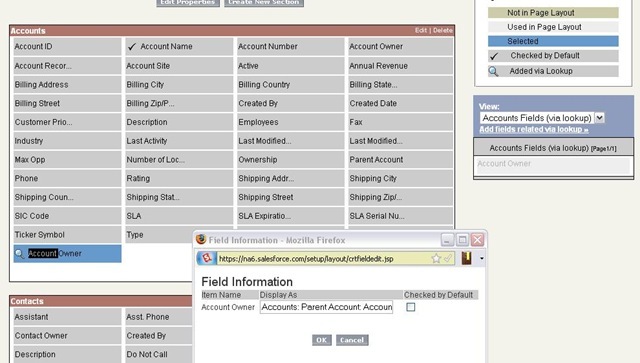 In my example I create a field for the owner of the parent account. See the â€œAdd fields related via lookupâ€â€¦ its your friend. 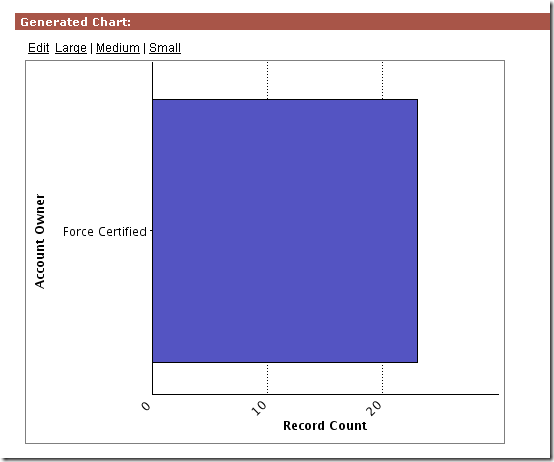 Graphs are not available for Tabular reports. Grouping must be selected. After all, you would only have one bar! This process is very similar to dashboard creation, and that is probably easiest to learn just by doing. Create a sample summary and matrix report, and get an understanding of the differences between the two, as well as all of the report options. The key limitation with filtering is that it cannot accept variables on both sides of the equation. For instance, you could not create a filter that says â€œshow me all accounts that contain the accountâ€™s stateâ€ (because account state is a variable) but you could say â€œshow me all accounts that contain the word â€˜Californiaâ€™â€. Anything to the right of the formula must be static. Columns to total- New Formula. Summary formulas let you perform the above math across the entire report. You cannot inject any logic into these formulas. Select Chart & Highlights. Select a summary total, select values and colors for each point. This will only color highlight summary totals, and is only available for Summary/Matrix reports accordingly. A dashboard is a compilation of different reports or external data. This collection of reports can be designed for a specific purpose. 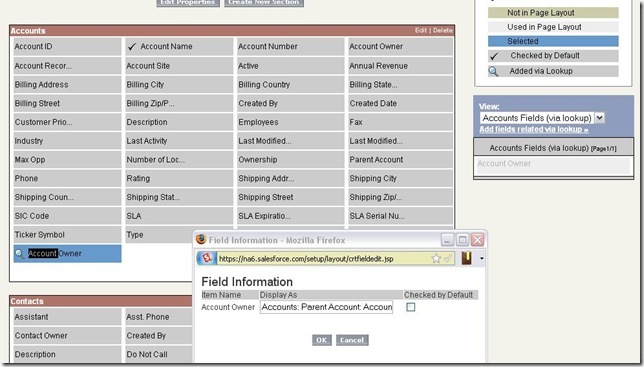 For instance, a Sales dashboard may have information about sales for each sales rep, number of calls made, etc. A dashboard is only as current as its last refresh. Dashboards can be refreshed on a schedule (and emailed upon refresh), or manually. Ultimately their purpose is to provide information from several reports in one location. 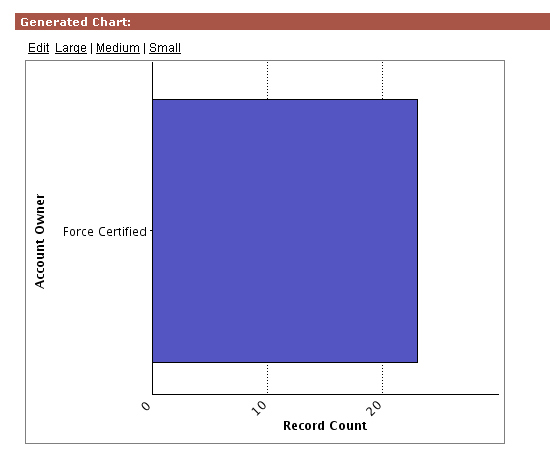 View some of the salesforce dashboards as examples. Create your own- make sure to try out each report type and dashboard metric. nting. Export gives you a CSV/Excel document with sort-friendly data. EE/UE only. Up to 5 contacts outside of Salesforce users can be emailed. From the refresh menu on the dashboard, select schedule. See â€œScheduling a dashboard refreshâ€ for more info. The dashboard will use the permissions of whoever is selected as the running user. This means that if a system administrator is the running user, all data can be seen and subsequently reported, while a standard user in a lower role may display different results. However that standard user could potentially have permission to view the administratorâ€™s dashboard. In that case the user would have permissions to view the top-level information in the dashboard. Once they clicked into a report within the dashboard, that report would display whatever records they have access to view (which could potentially be different than the top level dashboard information). 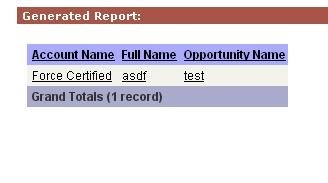 Administrator creates report for all opportunities (includes Management and Sales User). This report is added to the sales dashboard which is viewable by all users. Sales User can see the top level detail in the dashboard. Now, letâ€™s say that the sharing model for opportunities is set to private, which means that sales user would not be able to view anyone elseâ€™s opportunities. When sales user clicks on a report within the dashboard, that user will be limited to seeing the records that he has permission to view (only his own), and the totals in the report would be different than the dashboard itself.